Laser treatment, also called laser photocoagulation, is a common treatment for retinal diseases such as age-related macular degeneration, diabetic retinopathy and other eye diseases in which there is fluid leakage. The laser treatment involves beaming a strong laser light into the eye, through a dilated pupil, so that it makes very specific, tiny burns into the retina. This may seem like a strange treatment at first, as this is going to damage the retina, but the laser light acts as a sort of microsurgery method that seals and cauterises leaky blood vessels. Clinical trials have shown that several types of laser treatment can protect the eye from further degeneration, and can slow down or even halt the process of sight and vision loss. An argon laser is used to cause a tiny burn about one fifth of a pinhead. This can be employed in different ways – it can destroy tissue that has become short of oxygen, and has died, it can seal blood vessels by acting as a type of ‘spot weld’, it can remove adhesions, it can destroy new blood vessels that are emerging through the retina and threatening the photoreceptor cell layer. This last technique is particularly useful in wet age-related macular degeneration. This form of the disease is typified by the growth of many new blood vessels at the back of the eye, cause lots of tissue fluid leakage and bleeding. By destroying these new blood vessels early in their formation, a lot of damage can be prevented. A laser called an ND:YAG laser is commonly used to treat people whose sight is disturbed by dense tissue or clumps of cells and debris floating in their vitreous humour. It is normal to see some ‘floaters’ during all times of life, but these can become very obtrusive in the aging eye. This type of laser is used to break up the particles responsible for disruption to vision. This type of laser treatment is specific for diabetic retinopathy. It is used to treat people with diabetes who have developed retinal damage and who are showing the early signs of abnormal blood vessel growth in the retina. It is done with diode laser or an argon laser and the treatment is concentrated away from the central area of visual acuity, the macula. 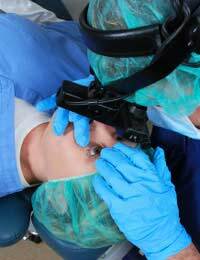 This form of laser treatment is quite intense, and it would damage this area of the retina and reduce sight rather than protect it. No-one can claim that retinal laser treatment is a pleasant experience but it is not so painful that it requires a general or even local anaesthetic. Some people prefer to have a little local anaesthetic that is applied as eye drops, but most people do not need it. Keeping still is the most difficult part of the procedure but the laser treatment itself lasts only a few minutes. Amazingly, during this time, pan retinal photocoagulation can deliver over 1500 different laser marks onto the retina. The after effects of laser treatment on the retina vary with the type of laser treatment and also between different people. Most doctors advise that your vision with be disturbed after treatment. People generally find that their eyesight is blurred for a few days, and maybe their eyes feel a little sore. It is not a good idea to drive after treatment, but after a couple of days rest it is usually possible to return to work and other normal activities. Follow up to laser treatment involves looking for positive changes, any reduction in swelling and a curbing of new blood vessel growth. If this is kept in check, regular monitoring is still a good idea, so that the treatment can be repeated if these symptoms come back.